One of the hardest medical questions I get asked a lot is, “why does my dog pant so much?” All pet parents know that dogs pant to cool off after exercise. 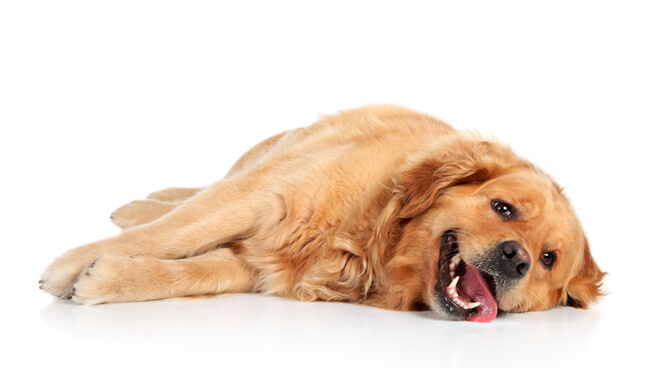 What these clients are asking, is why are their dogs panting when they are not exercising? Sometimes the cause is obvious. Other times it is downright mysterious. 1) Heat and Humidity – Dogs do not have sweat glands so when the temperatures and humidity rise they have to pant to decrease their internal body temperature. With humidity this is still true in an air conditioned house. 2) Lung Problems – Pneumonia, asthma or other allergic problems or fungal infections can decrease lung capacity and cause dogs to pant. 3) Heart Problems – When the heart suffers from problems so blood is not pumped from it effectively, blood and fluid can build-up in the lungs and cause panting. 4) Medications – Some medications can cause panting. Prednisone, heart medications and phenypropanolamine (female urine incontinence medication) are very common drugs that cause panting. 5) Breed – Dogs like Bulldogs, Boston Bull Terriers, Boxers with short “pug” noses pant to overcome the restricted ability to breathe through their nose. 1) Diabetes – Diabetic dogs that need insulin often have blood that is very acidic. This dangerous situation can be tempered by panting. 2) Cushing’s Disease – This is a hormonal diseased caused by an overproduction of stress hormones from the adrenal glands (think adrenalin) near the kidneys. 3) Hypothyroidism – A hormonal condition that causes a decrease in thyroid hormone and slowed metabolism. These dogs are often overweight, “lazy” and seek warm spots. 4) Pain – Arthritic or other types of pain will cause increase panting. 5) Anemia – Blood loss or the destruction of red blood cells reduces the oxygen in the body and causes dogs to pant. Does your dog pant too much? Have her examined to determine the most likely cause.